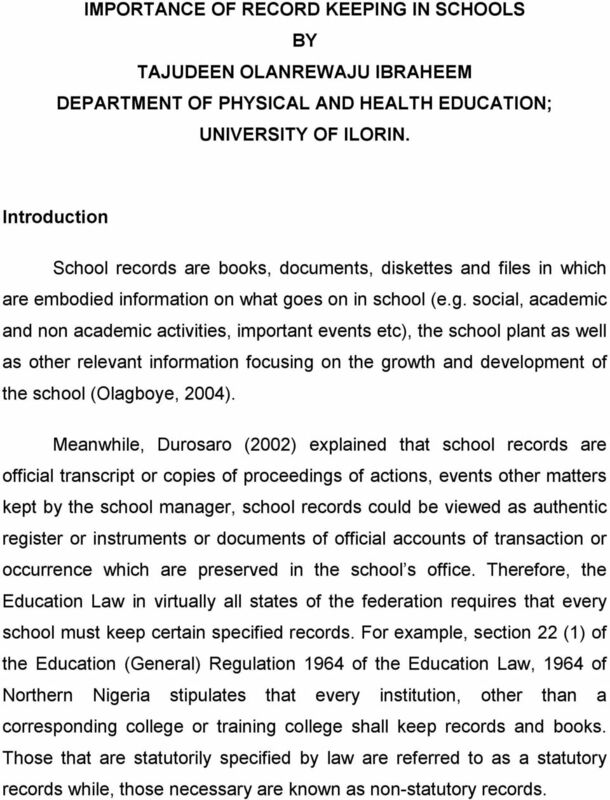 Download "IMPORTANCE OF RECORD KEEPING IN SCHOOLS BY TAJUDEEN OLANREWAJU IBRAHEEM DEPARTMENT OF PHYSICAL AND HEALTH EDUCATION; UNIVERSITY OF ILORIN." 1 IMPORTANCE OF RECORD KEEPING IN SCHOOLS BY TAJUDEEN OLANREWAJU IBRAHEEM DEPARTMENT OF PHYSICAL AND HEALTH EDUCATION; UNIVERSITY OF ILORIN. Introduction School records are books, documents, diskettes and files in which are embodied information on what goes on in school (e.g. social, academic and non academic activities, important events etc), the school plant as well as other relevant information focusing on the growth and development of the school (Olagboye, 2004). 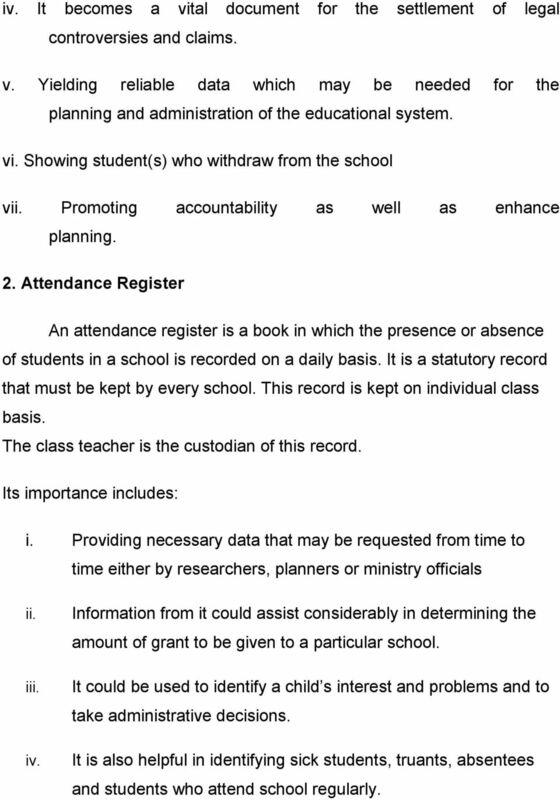 Meanwhile, Durosaro (2002) explained that school records are official transcript or copies of proceedings of actions, events other matters kept by the school manager, school records could be viewed as authentic register or instruments or documents of official accounts of transaction or occurrence which are preserved in the school s office. Therefore, the Education Law in virtually all states of the federation requires that every school must keep certain specified records. For example, section 22 (1) of the Education (General) Regulation 1964 of the Education Law, 1964 of Northern Nigeria stipulates that every institution, other than a corresponding college or training college shall keep records and books. Those that are statutorily specified by law are referred to as a statutory records while, those necessary are known as non-statutory records. 3 ix. enable school heads to collate information on pupils and staff for decision making by higher authorities, the law courts security agencies and other related government agencies when occasion demands x. provide a mechanism such as the school timetable for the productive management of time and coordination of school work and activities. xi. serve as data bank on which both the school head and staff and even students can draw on. Yahaya (2007), Olagboye (2004), Durosaro, (2002) & Akubue, (1991), also listed some specific importance which peculiar to each school records as; 1. Admission and withdrawal Register: This is a permanent record book into which is entered information regarding the entry and exit, including the details of the education and progress of each pupils that ever passes through the school; The importance includes i. Serves as a historical document or reference with detailed records of every child who was admitted into the school ii. The admission register is a reference for tracing the entry progress and exit of any student admitted into the school iii. It is useful in supplying information on the personal and family background of student. 4 iv. It becomes a vital document for the settlement of legal controversies and claims. v. Yielding reliable data which may be needed for the planning and administration of the educational system. vi. Showing student(s) who withdraw from the school vii. Promoting accountability as well as enhance planning. 2. Attendance Register An attendance register is a book in which the presence or absence of students in a school is recorded on a daily basis. 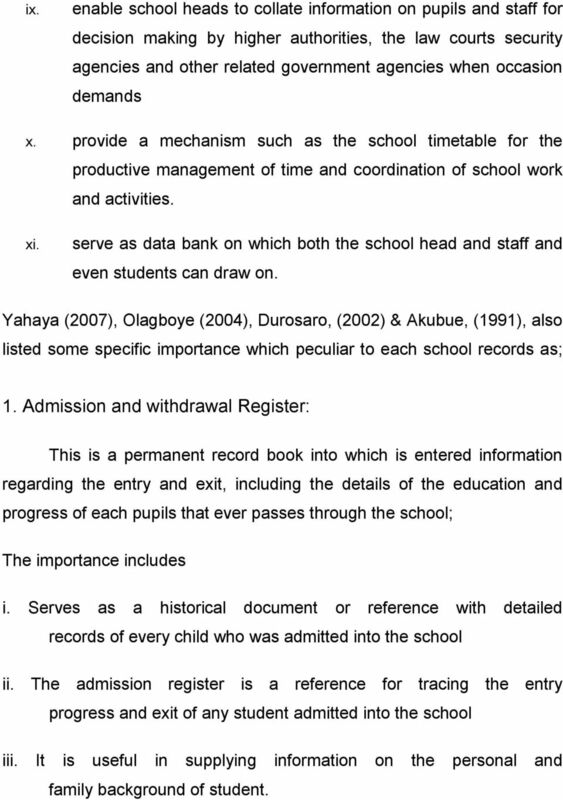 It is a statutory record that must be kept by every school. This record is kept on individual class basis. The class teacher is the custodian of this record. Its importance includes: i. Providing necessary data that may be requested from time to time either by researchers, planners or ministry officials ii. iii. iv. Information from it could assist considerably in determining the amount of grant to be given to a particular school. It could be used to identify a child s interest and problems and to take administrative decisions. It is also helpful in identifying sick students, truants, absentees and students who attend school regularly. 5 3. The log Book The log book is a historical record of events that have significant effects on the schools activities. Its importance are as follows; i. It records detailed happenings, during the visit of dignities whose signatures appear in the school visitors book ii. iii. iv. It gives background information to a new manager. It amplifies the local history of a village or town, especially the role of the school in such development. It reveal important events or occurrences in the life of the school e.g new building, rainstorm, collapsed building, motor vehicles, accidents in school, expulsion or fire disaster. 4. The Visitors book The book is meant for recording the visit of important personalities, including officials from the ministries of education or other related government agencies or any other school related visitors. Importance includes: i. It provides a record of the interest shown by the community in the school ii. It could serves as a means of getting the contact addresses of very important people who have shown interest in the school. 6 5. Staff and Students personal files It is necessary that the school should have as much information on every one of teachers and students as possible without violating their privacy. Importance includes; i. it provides current and first hand information on the staffing as well as studentary situation. ii. It helps in checking ghost workers and other financial abuse in schools. iii. It makes it easy to locate a teacher s or student s relatives during emergency. 6. Corporal punishment book The book contains the names of pupils who create disciplinary problems in school and the nature of punishment awarded mostly canning, flogging, whipping and hard knocks. Importances are: i. To ensure that proper procedure is followed in punishing offenders ii. It reduces cases of misuse of punishment iii. Recording and noting student name in the book naturally reduces indiscipline in schools. 8 10. 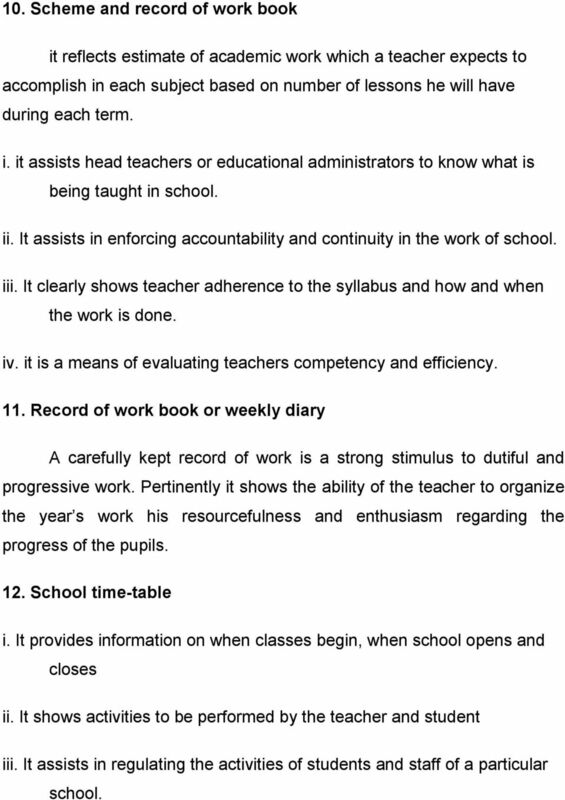 Scheme and record of work book it reflects estimate of academic work which a teacher expects to accomplish in each subject based on number of lessons he will have during each term. i. it assists head teachers or educational administrators to know what is being taught in school. ii. It assists in enforcing accountability and continuity in the work of school. iii. It clearly shows teacher adherence to the syllabus and how and when the work is done. iv. it is a means of evaluating teachers competency and efficiency. 11. Record of work book or weekly diary A carefully kept record of work is a strong stimulus to dutiful and progressive work. Pertinently it shows the ability of the teacher to organize the year s work his resourcefulness and enthusiasm regarding the progress of the pupils. 12. School time-table i. It provides information on when classes begin, when school opens and closes ii. It shows activities to be performed by the teacher and student iii. It assists in regulating the activities of students and staff of a particular school. 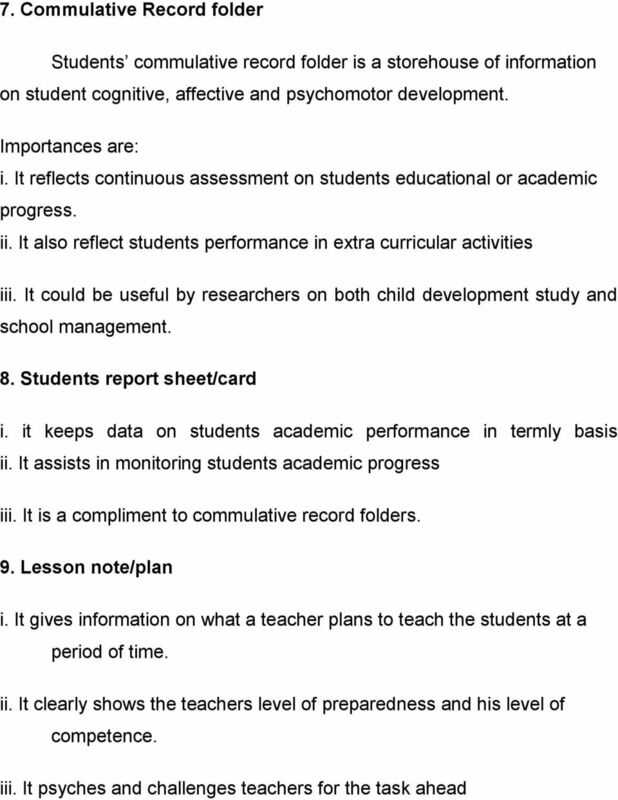 10 Conclusion The roles of head teacher and school records are synonymous because effectiveness and efficiency of head teacher depends largely on these vital documents. However class teacher should complement this task by effectively discharging their duties by proper keep and maintain these academic records for which they have direct responsibility Activities i. A child left home for school and he does not Show up in the class, when marking the class register the teacher marked him present, later in the day the parent come to check the Child in the School. How effectively can this case be treated? ii. iii. The head teacher of a school discovered that a teacher abused the use of corporal punishment on a erring Student. What are the necessary Solutions you as a head teacher will profer on this Case? What are the appropriate steps you will take to tackle illegal collection (money and materials) among Students and teachers in your schools. 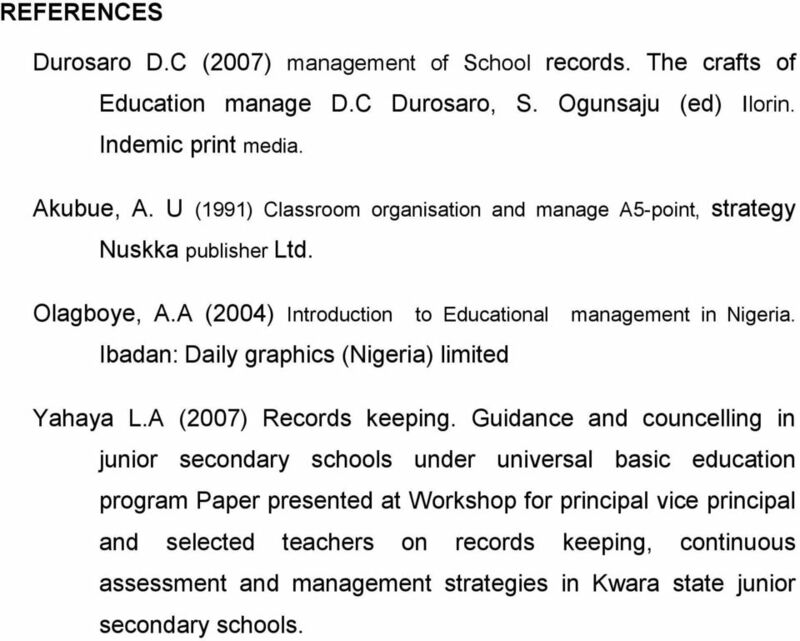 11 REFERENCES Durosaro D.C (2007) management of School records. The crafts of Education manage D.C Durosaro, S. Ogunsaju (ed) Ilorin. Indemic print media. Akubue, A. U (1991) Classroom organisation and manage A5-point, strategy Nuskka publisher Ltd. Olagboye, A.A (2004) Introduction to Educational management in Nigeria. Ibadan: Daily graphics (Nigeria) limited Yahaya L.A (2007) Records keeping. Guidance and councelling in junior secondary schools under universal basic education program Paper presented at Workshop for principal vice principal and selected teachers on records keeping, continuous assessment and management strategies in Kwara state junior secondary schools. E-Safety Policy. The policy is applicable to all on and off-site activities undertaken by students whilst they are the responsibility of the Trust. Ministerial Ordinance on Schools and Training Schools for Public Health Nurses, Midwives and Nurses (Ordinance of the Ministry of Education, Science and Culture and the Ministry of Health and Welfare No. ATTENDANCE POLICY It is the position of the Citrus County School Board that students must attend school on a regular and timely basis to maximize educational opportunities offered in Citrus County Schools. School: School may lose certain federal or state funds, if funding is based on attendance rates. This can affect all students in that school. Sneyd Green Primary School Mathematics Policy Together we make a difference. Schneps, Leila; Colmez, Coralie. Math on Trial : How Numbers Get Used and Abused in the Courtroom. New York, NY, USA: Basic Books, p i.